The Stack� is a multichair with three unique configurations that grow with baby: Highchair, Booster, and Youth Stool. 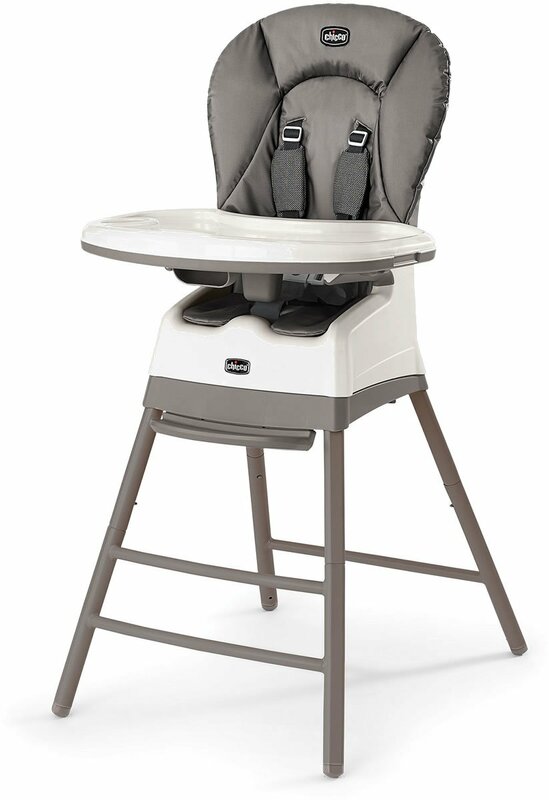 In its first mode, the Stack� offers all the convenience of an everyday highchair with a wipeable seat pad, five-point harness, removable tray, and three recline positions. As baby grows into a toddler, the highchair seat is easy to detach from its frame to create a high-back booster that secures to a dining chair for meals with the tray or at the table. Rubberized, pop-out feet for the booster help protect chairs. For older children, the highchair frame can be used as a stool with a contoured seat and pop-up backrest. I can't get the food stains out of the seat cover. I love the grey but I am so irritated about not being able to make it look like new again!! The chair is great, sturdy and versatile but if you have kids who make a mess this chair is not for you. You can't put the cover in the washer so even after wiping it down it never feels clean enough. There are so many tiny places where food hides. The warning labels are in the areas where you need to clean so they end up coming off after a while and if you don't remove them completely it looks dirty. It's just not worth it. We received this highchair 2 weeks ago and love it. It's perfect for our household. Our 4 year old has enjoyed sitting in the booster seat and the rest of the functions have worked great for our 10 month old. The seat is very secure even when she lunges forward while the lap table is off. I love that it is simple to use to change to its different functions. The table goes on and off easily which is superior to the previous high chair we had. So far it seems to clean well. We have been using this high chair for about a week and are loving it! It's easy to wipe down after messy meals, and I love that the tray detaches to be washed individually. It's sleek and modern design is not only beautiful but also incredibly functional. It's much more compact than other high chairs we have owned. My husband was able to assemble it within just a few minutes, which was an added bonus. I would definitely recommend this high chair! This product was given to me in exchange for my honest review. We love this Chicco chair. Not only is it a highchair, it can be quickly and easily changed into a booster seat or stool for an older child. I put it together in 20 minutes tops with instructions that were precise and very easy to follow. The design and overall make was solid and seems like it will last for a long time. 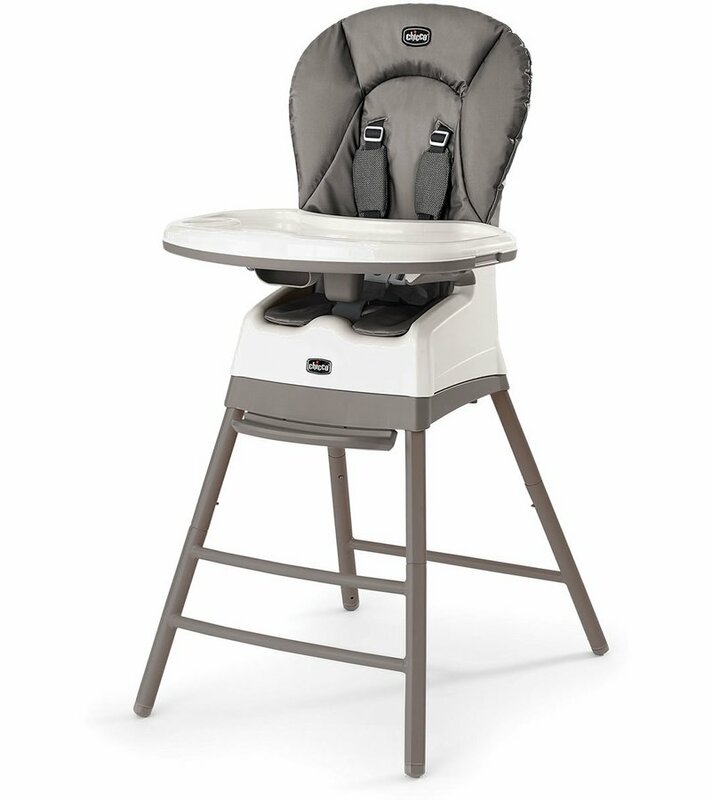 We have been mostly using it as a standard highchair right now, so the reclining features and removable tray and tray liner have been used frequently. The tray liner is great to change out quickly when baby makes a mess...you don't have to clean it right away and can use the actual tray as a back up until feeding/dinner is over. The tray also attaches to the back legs for easy storage. 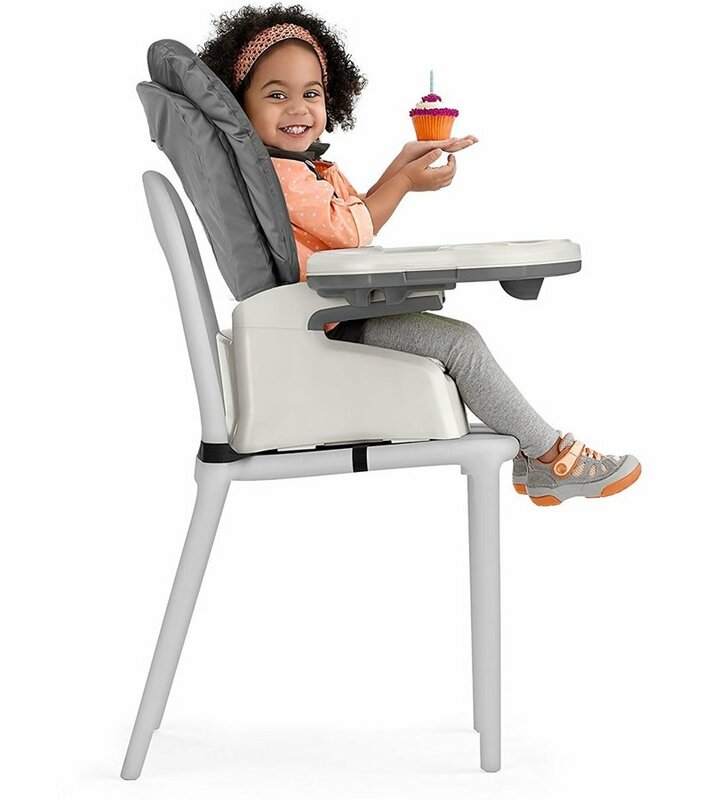 When baby gets older, I love that we can use the top portion as a booster seat that can be strapped to a dining chair. We have larger/wider dining room chairs at our table, so I was worried that the straps wouldn't fit around the back. I attempted it to see how this would go and they fit with a little strap left over! If you don't want the padding, you can just use the seat part of the booster also. It's also very lightweight and can be taken to a restaurant or grandma's house very easily. 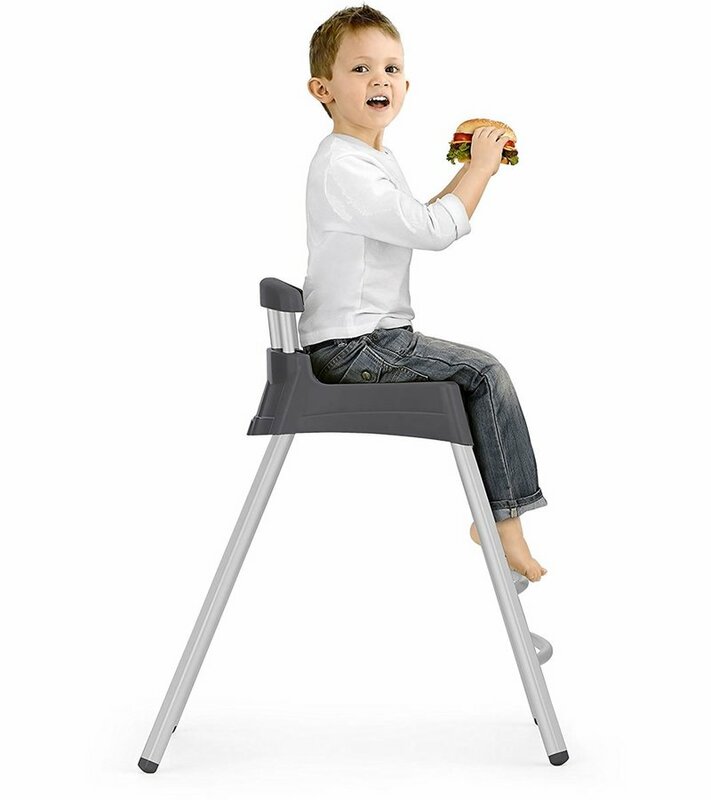 The stool chair is great for older children up to 60 lbs. and has a back that can be pulled up, like your child has his or her very own special seat at the table. Also, it is priced well and definitely worth every penny as we will be using this for quite some time with our growing child. So far I LOVE the Stack 3-in-1 highchair! I was immediately drawn to the color and style, I love how sleek and modern this highchair looks while also providing comfort to my son. The versatility of this highchair is impressive and it's so easy to convert the high chair from stage to stage. I also appreciate the fact that I won't have to buy an additional booster seat, so in the long run it's cost effective and will be one less thing that we will have to worry about storing in our small home. I'm a pretty petite person, so I love that I can pick up and move this highchair without any issues or the help of my husband! The tray is so easy to pull off and on with my son in one hand. One really cool feature is the tray sticks to the back of the high chair legs for easy storage. I personally haven't had any issues cleaning this chair, we just take a soapy wash cloth and it's good as new! I would recommend this product to all of my mom friends and would even give this as a baby shower gift! Chicco provided this product to me in exchange for my honest opinion. The high chair was easy to put together. I liked the reclining positions for the child as well as the easy to remove tray. I was able to hold onto the baby and remove it one handed. I also like the clear tray with cup holder that can be used. It makes it easy to take the clear tray off, clean, then place back on the regular tray. I have not had the opportunity to use the seat as a booster, however, it is easy to take apart to transition to the booster. It is very light to move and easy to take off the top part to make it into a booster seat. I really liked the look and color of the high chair. It looks modern. We have really enjoyed this high chair. This product came in several pieces, and was easy to put together. The quality of the high chair is excellent. My main goals were ability to clean easily and adjusts with my sons growth. These surpassed my expectations on those. The seat cover easily comes off to clean and easily lifts to clean under where food may sneak off to. The clear plastic serving tray that separates from the main tray is awesome. The tray is large and needs to be for my 1 year old. I have the ingenuity booster chair with the tray and needed something bigger and better. Unlike that one the food doesn't get caught as easily under the tray and the padded seat. The seat cover is also a material that is easily wiped down instead of others which require to be removed and washed with fruit and veggie stains. Straps can be used for a five point harness or you can just use the clicks around the waist. The tray can also snap on the the bottom back of the high chair. This snap is not easy and takes a little umph and concentration. I don't mind this as much because I usually just clean up right after he's done and place tray back in the place he's use it. The tray to snap in the seat when using is not difficult at all. My only other con is that there are no wheels of any kind. This means it scratches my hardwood floors if not lifted entirely off the floor to move. It's not heavy. But it can't be lifted one handed when I've got baby in hand. Overall, great purchase for someone who doesn't mind the wheels. Consno wheels of any kind. This means it scratches my hardwood floors if not lifted entirely off the floor to move. It?s not heavy. But it can?t be lifted one handed when I?ve got baby in hand. Tray does not snap easily to back of high chair as stated. 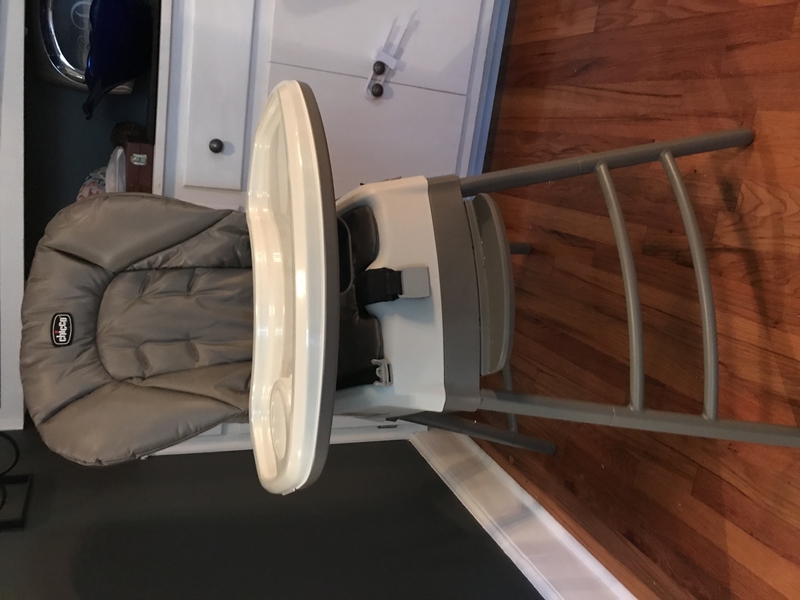 I really like this high chair overall: the tray that you can remove with one hand as well as the removable portion of the tray that you can clean separately are very convenient features. I would recommend it to other people. The only issue I really have with this high chair is the fabric cushion. It stains very easily, and even though it is "wipeable," certain foods that are yellow, red, or orange pretty much make permanent stains (would like to clarify that I wipe off the high chair after every use). The other thing about the fabric is that the protective plastic coating starts to peel off after awhile (especially around the strap protectors) which kind of defeats the purpose of it. In addition, I really wish the protective plastic extended to underneath the cushion - so much food accidentally falls in between the cushion and the seat that I've had a couple of "surprise mold" issues that required me to take the entire cushion off and put it in the washing machine (which Chicco does not recommended). I'd like to use this high chair for future children, but I would like to be able to buy a new seat cushion to replace the one I have since it's gotten so gross. 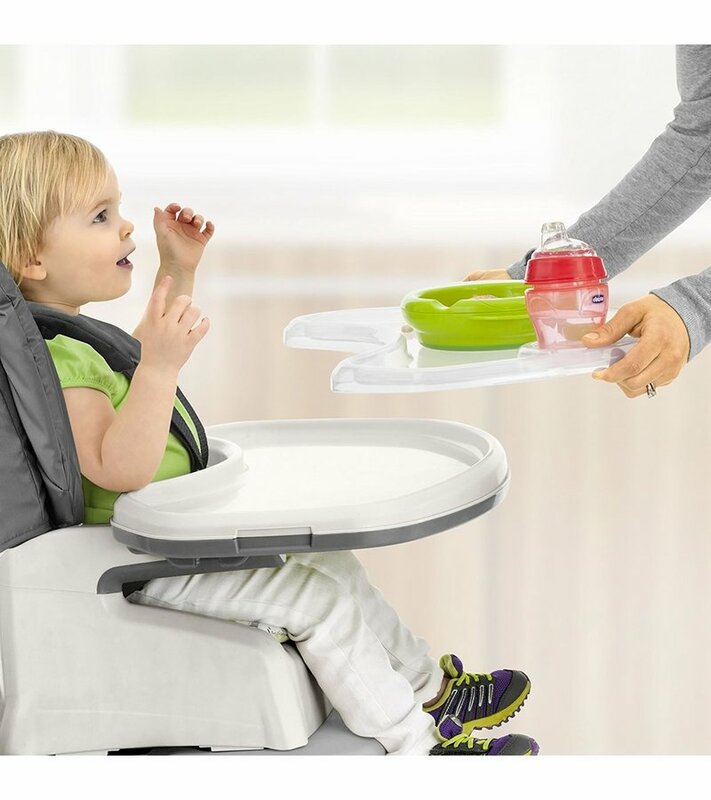 I really like this high chair overall: the tray that you can remove with one hand as well as the removable portion of the tray that you can clean separately are very convenient features. I would recommend it to other people. The only issue I really have with this high chair is the fabric cushion. It stains very easily, and even though it is "wipeable," certain foods that are yellow, red, or orange pretty much make permanent stains (would like to clarify that I wipe off the high chair after every use). The other thing about the fabric is that the protective plastic coating starts to peel off after awhile (especially around the strap protectors) which kind of defeats the purpose of it. In addition, I really wish the protective plastic extended to underneath the cushion - so much food accidentally falls in between the cushion and the seat that I've had a couple of "surprise mold" issues that required me to take the entire cushion off and put it in the washing machine (which Chicco does not recommended). I'd like to use this high chair for future children, but I would like to be able to buy a new seat cushion to replace the one I have since it's gotten so gross. My son is 9 months old and we have been using this high chair for only 3 months. He is quite messy as he refuses anything that he cannot feed himself. It is very hard to thoroughly clean this chair. Especially with the cover. Even the cover has become impossible to clean fully, as the top wipe clean layer of fabric is coming off. 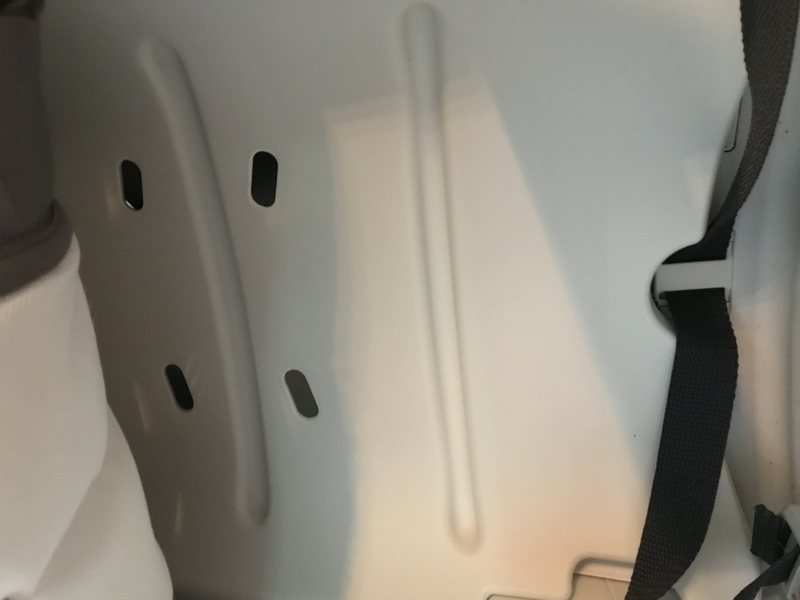 There is no way to purchase a new cover, and buying a new cover every 3 or so months simply makes these high chair way too expensive even if it were possible. I gave it 2 stars because my son seems to think it's comfortable. This is an awesome highchair and offers great features and flexibility at a really reasonable price. I love that my 4 year old can sit in the base at the table and I can also use the highchair (upper) part strapped to a chair for my toddler at the same time. The material is sturdy and easy to wipe down and the clear tray is also very easy to clean. I also like that the chair is attractive and smaller scaled for my not so big eating area. It blends in with my furniture and isn't brightly colored which is a bonus. Chicco provided this chair for an honest opinion and I really love it! This is the easiest highchair I've ever used! First, I must say the initial set up is so easy, no screwdriver required, everything just snaps right together. But make no mistake, it is very durable as I put all my weight on it to make sure. Second, I love the easy to clean fabric used for the seat and the detachable tray liner. Feeding my children can be pretty hectic and this makes clean up a breeze. My son is two going on three and I used all three stages with him. The conversion is so simple, you don't have to take the whole thing apart just to make it into something else. Also, the booster seat is detachable, which is so convenient if you want to take it with you and use it at a restaurant. I plan on using it for both my children who are two years apart. My oldest can sit in the booster and when my youngest is old enough I can the other part of the high chair for him. So, taking all of its many uses into consideration, I highly recommend this chair to anyone with children. First, I must say the initial set up is so easy, no screwdriver required, everything just snaps right together. But make no mistake, it is very durable as I put all my weight on it to make sure. Second, I love the easy to clean fabric used for the seat and the detachable tray liner. Feeding my children can be pretty hectic and this makes clean up a breeze.My son is two going on three and I used all three stages with him. The conversion is so simple, you don't have to take the whole thing apart just to make it into something else. Also, the booster seat is detachable, which is so convenient if you want to take it with you and use it at a restaurant. I plan on using it for both my children who are two years apart. My oldest can sit in the booster and when my youngest is old enough I can the other part of the high chair for him. So, taking all of its many uses into consideration, I highly recommend this chair to anyone with children. I have nothing but positive things to say about this new Stack highchair. I own several Chicco products and like all the other products this does not disappoint. The fashion is beautiful. I love the padded chair cover which is so easy to clean despite my very messy "do it herself" 14 month old eater. The booster seat easily detached for a quick travel solution which is a must for our family. I am very happy that the tray clips away for easy storage. I highly recommend this product to any family hoping to find a versatile highchair for any stage of feeding from infant to toddler and beyond. I was given this product in exchange for my honest review. 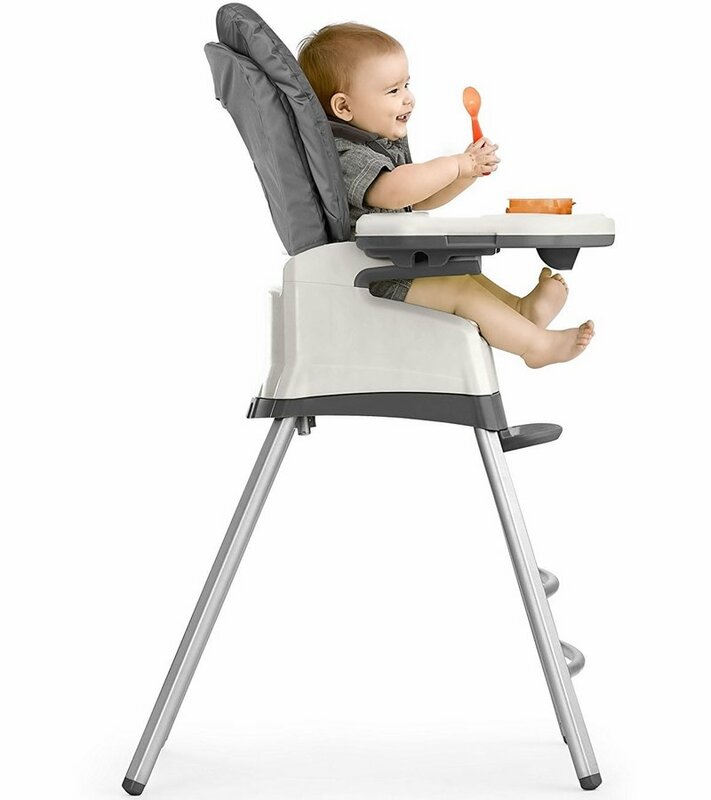 I have nothing but positive things to say about this new Stack highchair. I own several Chicco products and like all the other products this does not disappoint. The fashion is beautiful. I love the padded chair cover which is so easy to clean despite my very messy "do it herself" 14 month old eater. The booster seat easily detached for a quick travel solution which is a must for our family. I am very happy that the tray clips away for easy storage. I highly recommend this product to any family hoping to find a versatile highchair for any stage of feeding from infant to toddler and beyond. I was given this product in exchange for my honest review. I am thoroughly impressed with the New Stack 3-in-1 Highchair from Chicco. I nanny for a 22 mo. old as well as care for my own 2-1/2 year old and 4 year old. This highchair has proven to be a tremendous asset in our home and has provided simple care for little ones. I really like the stylish, washable padding on the chair which makes for simple clean up. I did loose one of the strap pads already. I'm sure I will find it, but it might be nice to have them sewn in somehow or not allow them to slip off so easily. The one hand tray removal is also one of my favorite features. I'm always holding either a child or a bowl of food in one hand so it was really helpful to be able to remove the tray without hassle. I am always a fan of products that adapt to your child's growth and development. This highchair certainly fit the bill. I was able to use it seamlessly for several different age children in my home. In fact, I am able to utilize the stool for my older son and the booster seat for my younger son at the same time! Super helpful for multiple children. I will certainly recommend this product to friends and family. Chicco graciously provided this product to me in exchange for my honest opinion. I am thoroughly impressed with the New Stack 3-in-1 Highchair from Chicco. I nanny for a 22 mo. old as well as care for my own 2-1/2 year old and 4 year old. This highchair has proven to be a tremendous asset in our home and has provided simple care for little ones. I really like the stylish, washable padding on the chair which makes for simple clean up. I did loose one of the strap pads already. I'm sure I will find it, but it might be nice to have them sewn in somehow or not allow them to slip off so easily. The one hand tray removal is also one of my favorite features. I'm always holding either a child or a bowl of food in one hand so it was really helpful to be able to remove the tray without hassle. I am always a fan of products that adapt to your child's growth and development. This highchair certainly fit the bill. I was able to use it seamlessly for several different age children in my home. In fact, I am able to utilize the stool for my older son and the booster seat for my younger son at the same time! Super helpful for multiple children. I will certainly recommend this product to friends and family. Chicco graciously provided this product to me in exchange for my honest opinion. I love the 3 in 1 feature that I'm able to use this as my baby grows. Easy assembly. The material wipes off nicesy which is great with my messy son. I love being that I'm able to use it as a booster, makes it portable and I can use it like a big boy chair. Chicco provided me with this highchair in exchange for my honest opinion and I love this highchair. As a first time expecting mother, receiving easy/ simple instructions and a user friendly assembly process- it keeps this momma at ease! cant waot to put it to good use. As a first time expecting mother, receiving easy/ simple instructions and a user friendly assembly process- it keeps this momma at ease! can't waot to put it to good use. This highchair is for my 9 month old baby and so far we love it!! Easy to put together. I love how padding is comfortable fabric and I usually let her sit there for a bite after a meal and don't have to worry about not having enough material support.